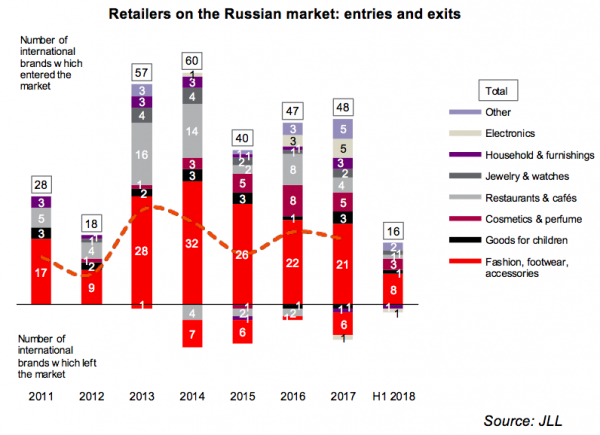 According to JLL, three quality shopping centres were opened in Moscow in H1 2018, totalling 98,500m². 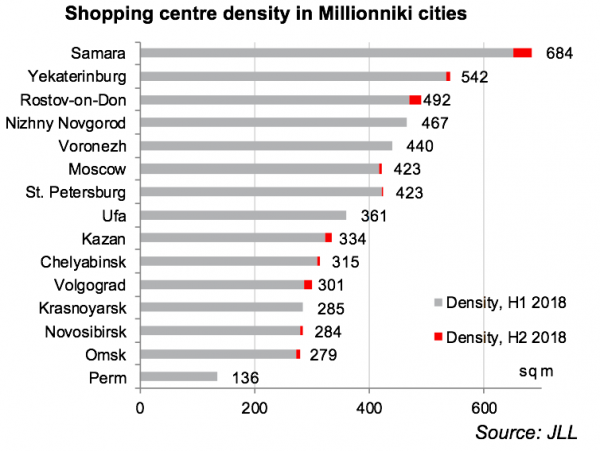 With the new completions, Moscow shopping centre density reached 418m² per 1,000 inhabitants. The same indicator in St. Petersburg was 422m². Only one quality shopping centre, Milya in Zhulebino (19,000m²), was launched in Moscow in Q1 2018. Two projects, this year’s largest, Kashirskaya Plaza SEC (71,000m²), and a neighbourhood PetrovskiySC (8,500m²), entered the Moscow shopping centre market in Q2 2018. In comparison, there were no deliveries during the same period last year. SC within the Rasskazovka TPU (19,000m²), Arena Plaza (17,000m²), Galeon (14,000m²) and Angara (7,000m²) are among upcoming 2018 projects. Thus, total annual completions will amount to 163,000m², bringing just 5% growth from last year’s five-year low. 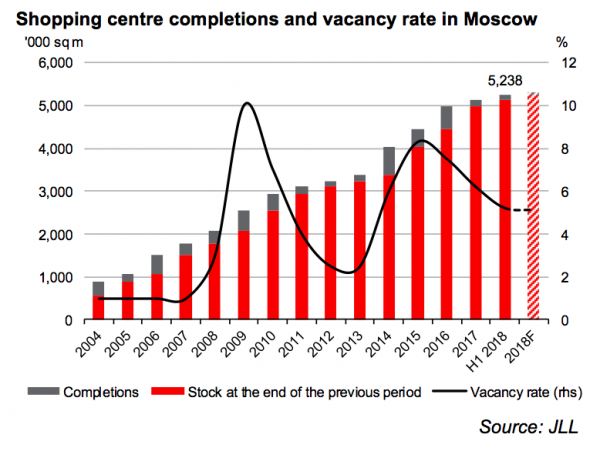 The shopping centres of 2016-2017, such as Riga Mall, Butovo Mall and Vegas Kuntsevo, saw the highest vacancy drop in H1 2018. In addition to high occupancy at the opening, newly constructed SCs have a significant share of food and entertainment zones, which generate additional traffic to a mall through the variety and quality of the offer. For example, these categories account for 21% of GLA in Vegas Kuntsevo, and for 35% in Kashirskaya Plaza. ADG group states that the F&B space will occupy 15-20% of the leasable area in their neighbourhood SCs, excluding the cinema area. On average, cafes and restaurants together with leisure operators occupy about 17% of GLA in Moscow shopping centres. For new international retailers, H1 2018 showed a negative trend compared with the same period last year. Only 16 new brands entered the Russian market, which is 45% lower YoY, when there were 29 debuts. Moreover, most of the newcomers are middle-priced retailers, while the number of new luxury and premium brands declined from 18 to 7. Nevertheless, several major international retailers announced openings of their first mono-brand stores in Russia. It is expected that Swedish fashion retailer COS will debut in AFIMALL City, DreamPlay by DreamWorks is about to appear in Aviapark, and CJ CGV (the fifth largest cinema operator in the world) signed a leasing agreement with ADG group to open cinemas in their neighbourhood projects. The French makeup brand Sephora and the American fast food operator Panda Express are among the other announced openings for H2 2018. Among the prominent debuts of H1 2018 are some brands which returned to the Russian market, such as the American bags and accessories brand Coach and the German fashion retailer Orsay. Another notable opening is the largest pet store of Dino Zoo from the Czech Republic. Two international retailers left the market in H1 2017, the Finnish K-Rauta and the German Media Markt.